When deck coatings are being applied at a job site, it is the only time when golf shoes are mandatory attire! 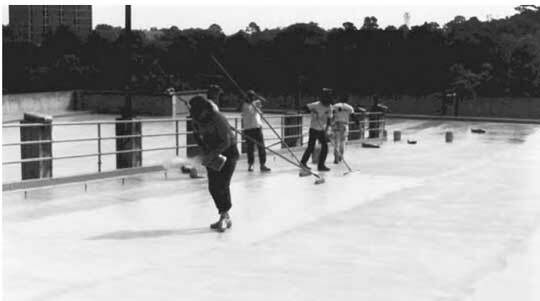 Liquid deck coatings are required to be squeegee-applied to ensure sufficient and uniform millage. The millage rate is too thick for spray applications, which cannot also provide the uniform thickness required. During application the squeegee is pushed, not pulled, to prevent the blade end of the squeegee from being pulled down too hard against the substrate and applying too thin a wet millage of material. Pushing of the squeegee blade maintains the blade in an upright position and a uniform millage application. This pushing of the squeegee requires that the mechanic walk through the applied material, thus requiring the golf shoes so as not to damage the installation and have shoes stick to the wet membrane. The material self-levels after installation, so that any minute impressions the golf-shoe spikes leave are quickly covered by the material. Most deck coatings also require that the material be immediately back-rolled after initial squeegee application to further ensure uniformity of millage. These applicators must also wear the golf shoes, as do those applying the aggregate that forms the wearing surface in the top coat applications. Figure 3.21 pictures the application process of a typical deck coating application. Substrate adhesion and proper substrate finishing are critical for successful deck-coating applications. In general substrates must be clean, dry, and free of contaminants. Concrete substrates exhibiting oil or grease contamination should be cleaned with a biodegradable degreaser such as trisodium phosphate. Contaminants such as parking-stall stripe paint should be removed by mechanical grinder or sandblasting (Figs. 3.22 and 3.23). FIGURE 3.22 Mechanical removal of contaminants. 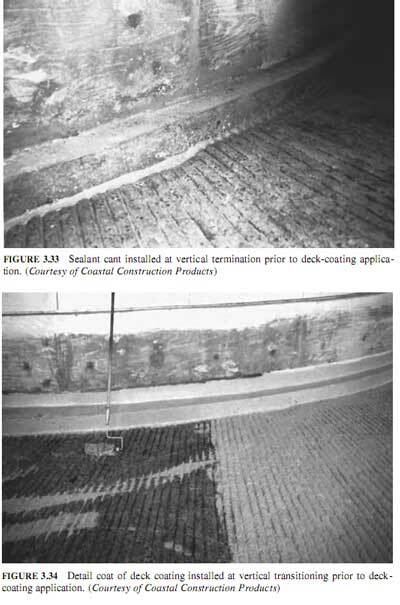 FIGURE 3.23 Substrate has been scarified prior to deck-coating application to ensure proper adhesion. For new concrete substrates, a light broom finish is desirable. Surface laitance, fins, and ridges must be removed. Honeycomb and spalled areas should be patched using an acceptable nonshrink grout material. Coatings should not be applied to exposed aggregate or reinforcing steel. If present, these areas should be properly repaired. 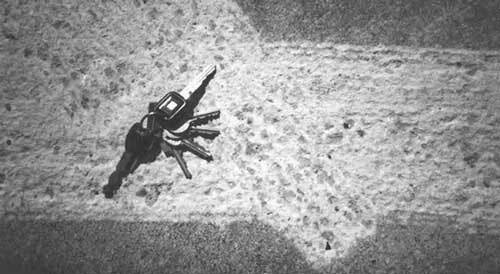 Concrete surfaces, including patches, should be cured a minimum of 21 days before coating application. Use of most curing compounds is prohibited by coating manufacturers, since resins contained in curing compounds preventadequate adhesion. 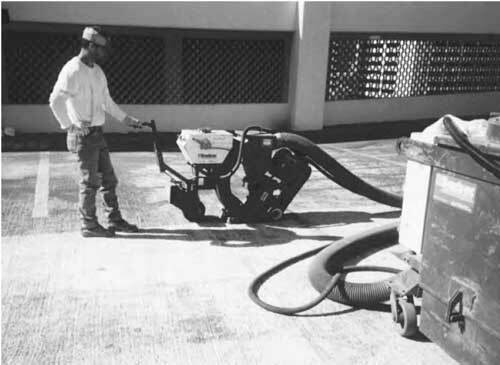 If present, substrates require preparatory work, including sandblasting, or acid etching with muriatic acid. Water curing is desirable, but certain manufacturers allow use of sodium silicate curing agents. 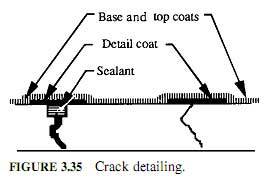 Substrate cracks must be prepared before coating application (Fig. 3.24). Cracks less than 1 16 in wide should be filled and detailed with a 4-in band of nonflow base coat. Larger cracks, from 1 2 in to a maximum of 1-in width, should be sawn out and filled with ure- thane sealant (Fig. 3.25). 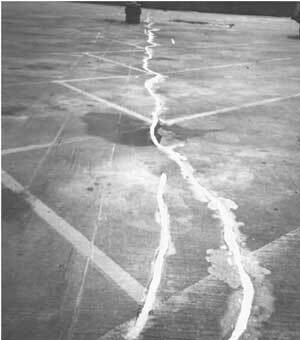 Moving joints should have proper expansion joints installed with coating installed up to but not over these expansion joints. Refer to Figs. 3.26 and 3.27 for typical expansion joint detailing. Substrates should be sloped, to drain water toward scuppers or deck drains. Plywood surfaces should be swept clean of all dirt and sawdust. Plywood should be of A-grade only, with tongue and groove connections (Fig. 3.28). Only screw-type fasteners should be used, and they should be countersunk. The screw head is filled with a urethane sealant and troweled flush with the plywood finish (Fig. 3.29). As these coatings are relatively thin, 60–100 mil dry film, their finish mirrors the substrate they are applied over. Therefore, if plywood joints are uneven or knots or chips are apparent in the plywood, they also will be apparent in the deck-coating finish. 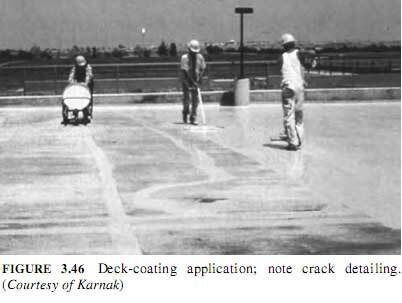 FIGURE 3.24 Crack repair prior to deck-coating application. FIGURE 3.29 Deck-coating details for plywood deck applications. Metal surfaces require sandblasting or wire-brush cleaning, then priming immediately afterward (Fig. 3.30). Aluminum surfaces also require priming (Fig. 3.31). Other substrates such as PVC, quarry tile, and brick pavers should be sanded to roughen the surface for adequate adhesion. Sample test areas should be completed to check adhesion on any of these substrates before entire application. For recoating over previously applied deck coatings, existing coatings must be thoroughly cleaned with a degreaser to remove all dirt and oil. Delaminated areas should be cut out and patched with base coat material. Before reapplication of topcoats, a solvent is applied to reemulsify existing coatings for bonding of new coatings. All vertical abutments and penetrations should be treated by installing a sealant cove, followed by a detail coat of nonflow material (Figs. 3.32, 3.33, and 3.34). If a joint occurs between changes in plane such as wall-to-floor joints, an additional detail coat is added or reinforcement. Figures 3.35 and 3.36 show typical installation procedures for this work. With new construction, detail coats of base coat membrane are turned up behind the facing material (e.g., brick cavity wall), followed by coating and detailing to the facing material. This allows for double protection in these critical envelope details. At doors or sliding glass doors, coating is installed beneath thresholds before installation of doors. Figure 3.37 shows application procedures at a deck drain. For applications over topping slabs with precast plank construction, such as double-T, a joint should be scored at every T-joint. These joints are then filled with sealant and adetail coat of material is applied allowing for differential and thermal movement. Refer to Figs. 3.38 and 3.39 for typical installation detail at these areas. 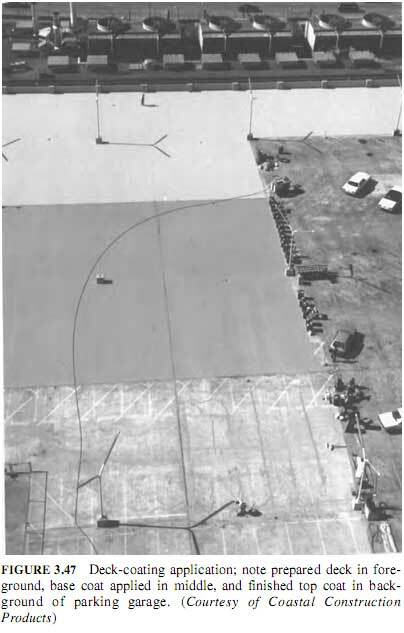 Base coats are installed by notched squeegees for control of millage, typically 25–40 mil dry film, followed by back-rolling of materials for uniform millage thickness (Fig. 3.40). Following initial base-coat curing, within 24 hours intermediate coats, topcoats, and aggregates are installed (Fig. 3.41). Aggregate, silica sand, and silicon car- bide are installed in intermediate or final topcoats or possibly both in heavy traffic areas. On pedestrian decks grit is added at a rate of 4–10 lb square (100 ft^2) of deck area. In traffic lanes, as much as 100–200 lb of aggregate per square is added. Aggregate is applied by hand seeding (broadcasting) or by mechanical means (Fig. 3.42). If aggregate is added to a topcoat, it is back-rolled for uniform thickness of membrane and grit distribution. With installations of large aggregate amounts, an initial coat with aggregate fully loaded is first allowed to dry. Excess aggregate is then swept off, and an additional topcoat is installed to lock in the grit and act as an additional protective layer. See Fig. 3.43 for aggregate comparisons. Intermediate coats usually range in thickness from 10 to 30 mil dry film, whereas top coats range in thickness from 5 to 20 mil. Refer to Figs. 3.44 and 3.45 for typical millage requirement. Final coats should cure 24–72 hours before traffic is allowed on the deck,paint stripping is installed, and equipment is moved onto the deck. Approximate coverage rates for various millage requirements are shown in Table 3.21. Trowel systems are applied to considerably greater thickness than liquid-applied systems. Troweled systems range from 1 /8–1/ 4 in total thickness, depending upon the aggregate used. Other than applications of acrylic coatings, manufacturers require primers on all substrates for improved membrane bonding to substrates. Primers are supplied for various substrates, including concrete, wood, metal, tile, stone, and previously coated surfaces. Additionally, priming of aggregate or grit is required before its installation in the coating. 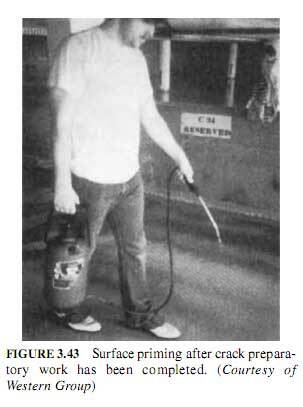 Some primers must be allowed to dry completely (concrete); others must be coated over immediately (metal). In addition to primers, some decks may require an epoxy vapor barrier to prevent blistering from negative vapor drive. Because of the volatile nature and composition of deck-coating materials, they should not be installed in interior enclosed spaces without adequate ventilation. Deck coatings are highly flammable, and extreme care should be used during installation and until fully cured. Deck coating requires knowledge- able, trained mechanics for applications, and manufacturer’s representatives should review details and inspect work during actual progress. 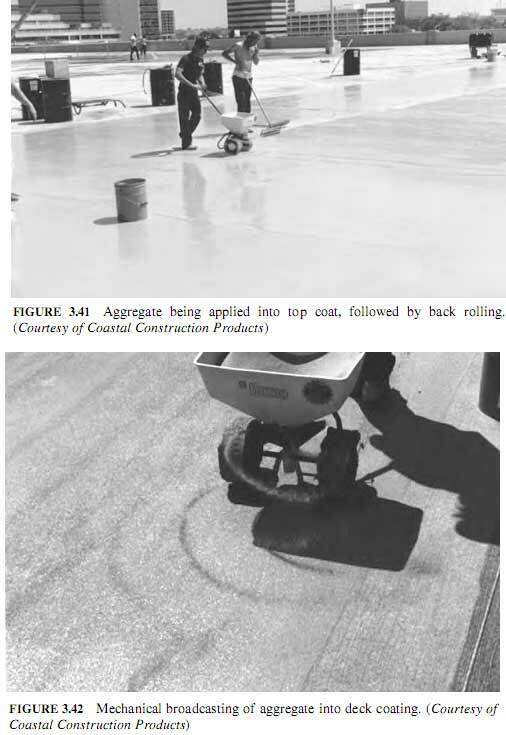 Figure 3.46 demonstrates proper deck coating application, and Fig. 3.47 demon- strates the various stages of deck-coating application.